The IILJ builds on NYU’s stellar international law faculty and is closely connected with leading scholars worldwide. The IILJ Scholars and affiliated doctoral students and visiting fellows are an integral part of the research environment at the IILJ. The IILJ’s core team consists of Faculty Director Benedict Kingsbury, Program Director Angelina Fisher, Institute Fellows Paul Mertenskötter and Thomas Streinz, and Institute Administrator Rachel Jones. The International Society of Public Law (ICON-S) is committed to an inter-disciplinary approach to public law that engages constitutional, administrative and international law scholars and practitioners so as better to understand global and transnational legal developments. 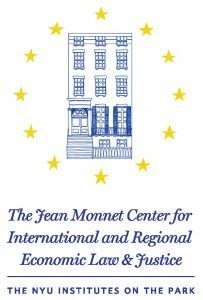 The Jean Monnet Center for International and Regional Economic Law & Justice focuses on the study of international and European economic integration and European Union law. The Center on Law and Security is a non-partisan multidisciplinary research institute established in 2003 to focus on cultivating an informed dialogue and conducting groundbreaking research on the most important national security, legal, and strategic issues of the post-9/11 era. The U.S.-Asia Law Institute seeks to promote the rule of law and human rights in Asia, including both domestic and international law. The Information Law Institute is an academic center for the study of law, policy, and social norms defining and affecting the flow of information in a digitally networked society.